After Elixa witnesses an explosion on the moon (based on a real life event in 1178), she finds a secret cave hidden in the mountains where she lives. This image depicts the sun rising and shining into a dolmen at Newgrange in Ireland, but in my fictional dolmen, I used the full moon. What happens that Elixa finds the dolmen? And what does she discover hidden inside? 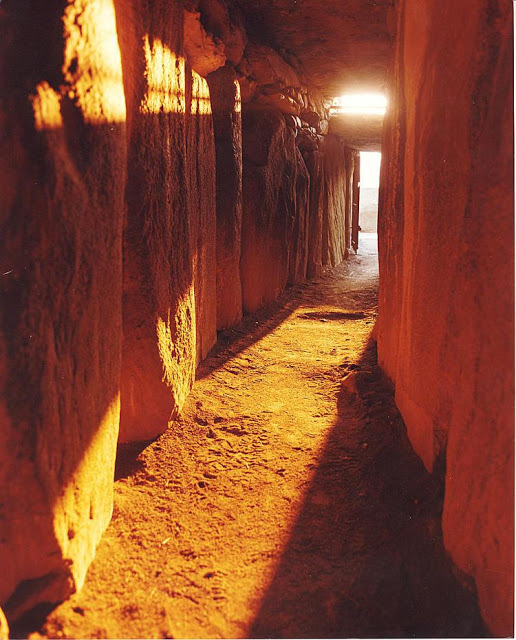 At the Newgrange Dolmen in Ireland, once a year, at the winter solstice, the rising sun shines directly along the long passage into the chamber for about 17 minutes and illuminates the chamber floor. This alignment is too precise to be widely considered to be formed by chance. Professor M. J. O'Kelly was the first person in modern times to observe this event on December 21, 1967. The sun enters the passage through a specially contrived opening, known as a roofbox, directly above the main entrance. Although solar alignments are not uncommon among passage graves, Newgrange is one of few to contain the additional roofbox feature. The alignment is such that although the roofbox is above the passage entrance, the light hits the floor of the inner chamber. Today the first light enters about four minutes after sunrise, but calculations based on the precession of the Earth show that 5,000 years ago first light would have entered exactly at sunrise. This fictional dolmen is also featured in The Sacred Symbol. Grab your Free copy of Elixa - a historical thriller filled with conspiracy, heresy, the might of the medieval church, a mysterious Moor, alchemy, a love-struggle and a touch of the supernatural.